Scandi living - it’s the epitome of modern, sophisticated interior design. It’s hard to avoid that Scandinavian influence - it’s everywhere from Pinterest to your local homeware store. It’s a great style to bring into your home and one that can be done on any budget. When you purchase a new home, you can find that your decorating budget is quite limited with all of your funds used to facilitate the sale, but that doesn’t mean you can’t begin getting your home looking how you want it right away. Luckily for you, there are some great tips out there to help you achieve that stylish Scandinavian style on a budget. Take a look at how you can give your new home a contemporary Scandi makeover to fall in love. A lot of people talk about ‘Scandi style’, but what does it really mean? While you can read more about Scandi style in detail, the basics of it are pretty easy to understand. Influenced by several countries (Denmark, Sweden, Norway, Iceland and Finland), the main principles are based on minimal, simplistic designs that incorporate natural elements and a neutral color palette. 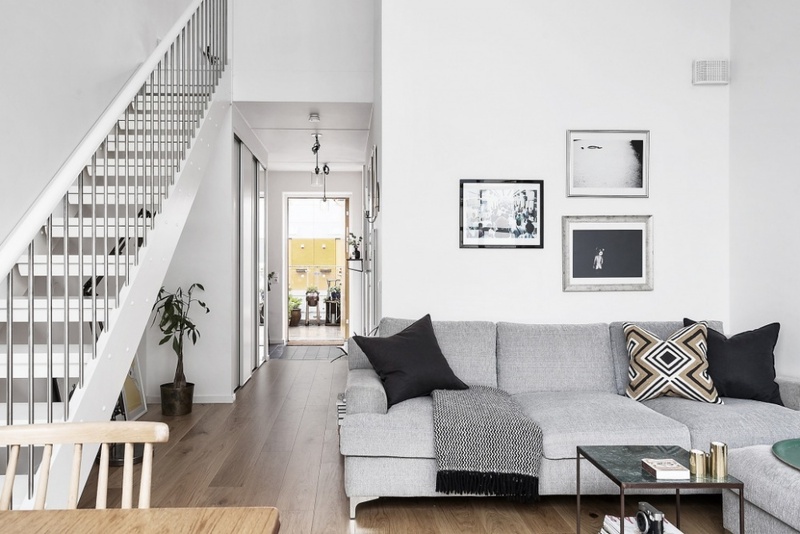 There are many great examples of Scandinavian style you can bring into your home, giving it a modern upgrade that will let you incorporate the latest trends with your own personal style. After finding your dream home to buy, you’ll want to hit the ground running with your interior design to get your home looking how you want it to look. However, you’ll be much better off putting a plan in place to make sure you can do things at a pace and budget that suits you. Many new homeowners can get carried away before they’ve even signed on the dotted line. Avoid ordering furniture items or booking contractors until you’ve got your sales and purchase agreement in place. This will avoid you being left with furniture and nowhere to put it and save you from disappointment should there be problems with your sale. Once you’ve got everything confirmed, you can start moving ahead with your plans for your exciting new home. Neutral colors are key to achieving that Scandi look. Keep an eye out for greys, pastels, white and cream. These colors are on-trend at the moment, making it easy for you to find the right paint shades, furniture styles and more. Pick a neutral base such as white or cream that you can then build color around. Get some inspiration for a Scandinavian color scheme from Pinterest to give you some cool ideas on what to look for. Minimalism is essential for achieving a Nordic look that looks like it’s come from the pages of a home magazine. With spring around the corner, now is the perfect time for decluttering - helping you get rid of any unwanted junk and give your space a cleaner look and feel. There are some simple tips you can follow to declutter your home that will make it much easier for you to keep your home organized. Take a look at every item and work out whether or not you still need it. If you haven’t used something in a year, and are unlikely to use it within the next year - you should look at either selling, recycling or donating the item. Anything that you’re left with can be stored away so that it has its own place - allowing you to free up space around your home. Scandinavian styles are open and airy, and even the smallest rooms can be made to feel lighter and look. You could start by painting your walls white or use white panels on the walls to make things look much more open. You can also make your room look brighter by using a daylight light bulb instead of the typical warm lights you get in homes. Using mirrors can help to create the illusion of space in your home, helping the light to travel around - a great tip if your home is lacking in windows! Scandinavian interiors incorporate a lot of natural materials such as wood, while also using fabrics such as wool, sheepskin, cotton and linen. When you’re decorating on a budget, it’s easy to pick up second-hand items that you can refinish or repurpose to give them a brand new look. Using natural materials is also kinder to the environment, making it much simpler to recycle your items if ever needed. You’ll find plenty of tutorials on YouTube of upscaling projects you might want to try to give new life to tired furniture items. One of the simplest ways to bring wood into your new home is to strip back the floors. Carpets are high maintenance, need replacing often and aren’t the best to have around if you have children or pets. Wooden floors, however, are very much on-trend at the moment, and by ditching your carpets in favor of wood - you’ll easily incorporate a more Scandi feel into your home. You could also explore using parquet floors to bring a minimalist feel to your home. While Scandinavian decor styles are cool and contemporary, there is also a lot of warmth that you can add to make your new house feel like a home. Embracing hygge is still one of the most popular lifestyle trends of recent years, and you can benefit from its influences to create a cozy, warm home. Think candles, fluffy textures, calming scents and an open fire (if you’ve got one) to help set the mood. Small home decor items are readily available at bargain prices. Stores like Urban Outfitters and Target have some amazing home decoration items that are affordable and high-quality, while Amazon, eBay and Etsy are also great options for choosing your home accessories. After working hard to purchase your new home, you deserve to have a space that looks how you want it to be. Give some thought to a Scandinavian makeover to transform your new home into a stylish, modern space you can be proud to live in.